I know I shouldn’t be, but I’m kind of embarrassed to admit that my love of storytelling didn’t come from literature, or even film. Not originally, anyhow. It came from video games. I could go on forever about the medium. But I’m here to talk about one game in particular, and how it influenced me growing up. A cult RPG on the Super Nintendo about a thirteen-year-old kid in contemporary America (called “Eagleland” in the game) alongside his best friends, saving the world from cosmic horrors. It’s one of the goofiest, trippiest games to come out of Japan at the time, and that’s saying something. In a time when most RPGs were sword-and-sorcery fantasy, along comes this game where the hero uses yo-yos and baseball bats, orders pizza from payphones to heal, uses the ATM to get money, sleeps in hotels, travels via buses and bicycles, gets homesick, goes backstage of concerts, and fights hippies, taxicabs, pedophiles, ramblin’ mushrooms, wild ducks, possessed tents, and more. All done to a jazzy, ‘60s-’70s Western pop music inspired soundtrack. You can practically sing the Beatles lyrics along with some of the game’s soundtrack. All this plus themes of courage and friendship and adventure. It was about leaving home and seeing the world–and not your usual fare of dark forests and magic castles, but of suburbia and big cities and wintery private schools and beachside vacation destinations. 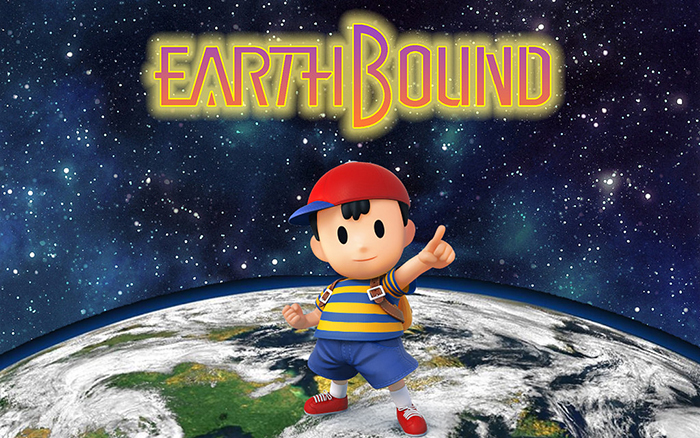 Ness, the hero, came from a small house in a suburb with his family. He had a baseball cap and a scruffy dog. He was me. And he had best friends that he saw the world with. This was my On the Road in the 1990s. It had a quirky, but heartfelt story that I fell in love with. And from then on, I needed my games to draw me in with the story and the setting and the characters–a fact that continues to this day. “Fun” is secondary to aesthetic and narrative. I want art and I want story. Games got me drawing and they got me reading and they inspired me to create my own stories. When I was in grade, oh, four or five, I did one of those reading evaluation things that teachers give you. They told me I read on a college-grade level. I was a quiet kid who had little use for books, but I read more than most book-lovers. After all, the games I loved were filled with words, back before everything was voice-acted. My reading skills came from games. It made me want to run away and have adventures. To write screenplays about psychics and mad scientists and aliens invading the suburbs. I wanted to build a house in the woods and listen to the Beatles on the radio all day long. I can think of so many beautiful, iconic moments in this goofy kids’ game that I could make this post go on and on and on. Ultimately, EarthBound gave my mind a fictional wanderlust. Even though it was a game, it made me appreciate the beauty of the world outside my house. I look at the stars or smell the earth after it rains and I remember this dreamy feeling of wanting to put on my trusty baseball cap, leave home and save the world. Games like EarthBound provided this imaginary escape–the same kind books like Huckleberry Finn would do for readers. It was freedom. And that freedom is why I play games.